See? Bill to the rescue! You know that there has been lots of behind the scenes negotiating for this to happen. We didn't even have to bomb or threaten them! Our roving reporters will be home soon! Can you imagine this horndog if he gets near any trafficgirls? Now North Korea knows that any time it wants attention all they have to do is take a couple of Americans hostage, trump up charges, and give them a long prison sentence. American leaders will come begging to the Dear Leader for mercy. Dear Leader, such a humanitarian! Looks like Hil's presidential bid is in full swing! And Laura and Euna are free! Excellent diplomacy by the Obama administration. Now the door is open to the nuclear issue - yes we can! God forbid any one of them should smile. Sheesh! No doubt Clinton was briefed not to smile in the presence of Dear Leader when cameras were around. They probably yucked it up in private. Yep, you're totally right here. I can see the White House directive - "no smiling around Jong Il when cameras are present." We're past this topic now, but I found this and thought it was interesting. I don't think they were "buddy-buddy"
"IT WAS a hard-eyed, unemotional get-together. They had never met face-to-face, but once sparred dangerously. Bill Clinton, the unusually unsmiling former American president who had probably come closer to fighting North Korea than any president since the Korean war, was in Pyongyang to win the release of two female American journalists facing 12 years of hard labour. There he met Kim Jong Il, the grim-faced leader of arguably the world’s most repressive regime and a defiant nuclear bomb-tester to boot. Mr Kim is an ace non-smiler. In receiving Mr Clinton (he had turned down earlier suggested emissaries), he was out to show his people and the world that, despite rumours of ill health, his was a regime to be reckoned with, and that even powerful America would have to reckon with it. 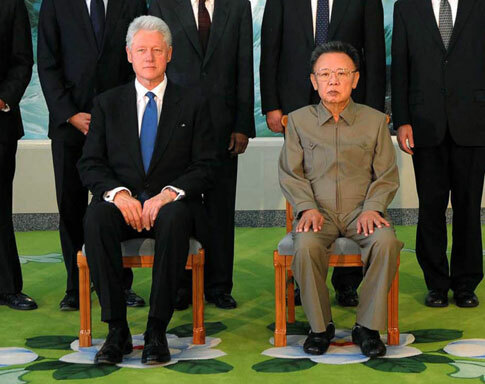 Mr Clinton, no doubt asked to do nothing to help Mr Kim’s cause, was determined above all, well, not to smile. Whether the normally affable Mr Clinton managed to stay poker-faced through the three hours and 15 minutes he and Mr Kim spent in each other’s company (long enough, even with translation, for a chin-wag), his aides are not saying."